Fortunately, I don't often write up a stock like Visa, which I just reviewed on May 29, 2008, suggested a "Buy" rating, buy shares of the stock and then go ahead and sell share just about two weeks later. But that is exactly what has happened! 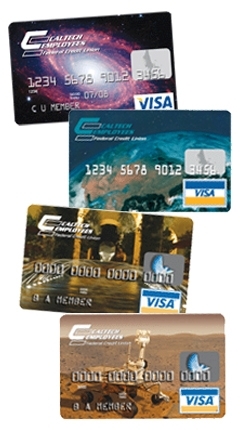 On May 29, 2008, after a partial sale of Copart on a gain, I purchased 70 shares of Visa (V) at a cost basis of $86.03. A few moments ago, with the market once again under pressure, Visa shares have been selling off and as I write are trading at $78.14/share, down $(2.17) or (2.70)% on the day. When they passed my (8)% loss level, I initiated a sale and sold all 70 shares at $78.99. This worked out to a loss of $(7.04) or (8.2)% since purchase. After an initial purchase of shares, no matter how much I 'like' a stock, I sell my shares should they decline to an (8)% loss. Since this is on 'bad news', I do not plan on replacing these shares, but instead am now back to my five position level, my minimum, and shall wait either for a sale on bad news (which I shall in this case find a replacement for), or a sale on good news to be buying a new position. 'Good news' for me is a partial sale of a holding at an appreciation target reached. Thanks again for visiting and stopping by! If you have any comments or questions, please feel free to leave them on the blog or email me at bobsadviceforstocks@lycos.com. First of all, what do they do? "...through its subsidiaries, provides offshore contract drilling services to the oil and gas industry. Its offshore contract drilling operations include exploration, development, and production of oil and natural gas. 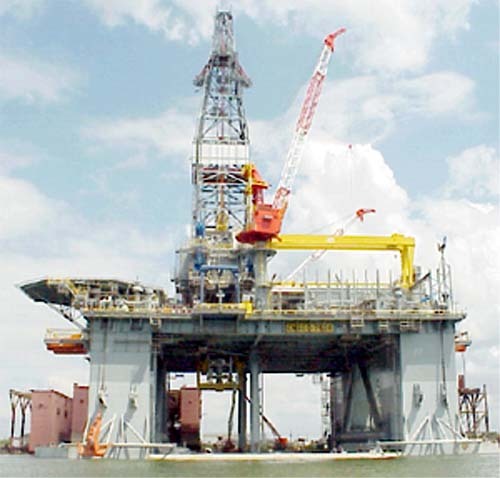 As of February 15, 2008, the company owned and operated 44 jackup rigs, 1 ultra-deepwater semisubmersible rig, and 1 barge rig. It also had four ultra-deepwater semisubmersible rigs under construction." And how did they do in the latest quarter? On April 24, 2008, Ensco (ESV) reported 1st quarter 2008 results. For the quarter ended March 31, 2008, revenue came in at $580.3 million, up from revenue of $514.1 million the prior year same period. Net income increased 17% to $272.0 million or $1.90/diluted share, up from $232.3 million or $1.54/diluted share the prior year. Perhaps equally important, from my perspective, was that the company which reported $1.90/diluted share, beat expectations of $1.81/share as surveyed by Thomson Financial. According to the Morningstar.com "5-Yr Restated" financials on ESV, the company has increased revenue (except for a slight dip from 2003 to 2004) from $733 million in 2003 to $2.14 billion in 2007 and $2.21 billion in the trailing twelve months (TTM). Earnings also dipped from $.66/share in 2003 to $.62/share in 2004 befor soaring to $1.87/share in 2005, and $6.73/share in 2007 with $7.09/share reported in the TTM. The company does pay a dividend of $.10/share which has been unchanged since 2003. Outstanding shares have been very stable and actually have decreased from 150 million in 2003 to 147 million in 2007 with 147 million in the trailing twelve months (TTM). Free cash flow improved from a negative $(126) million in 2005 to a solid $583 million in the TTM. The balance sheet appears solid with $665 million in cash and $540 million in other current assets. This total of $1.2 billion, when compared to the $443 million in total current liabilities yields a current ratio of 2.72. What about some valuation numbers? According to the Yahoo "Key Statistics" on Ensco (ESV), the company is a large cap stock with a market capitalization of $11.32 billion. The trailing p/e is a very cheap 11.09 with a forward p/e even better at 9.15. Thus, with strong estimates going forwards, the PEG works out to a downright reasonable level of 0.53 (5-yr expected). Even with this apparent reasonable valuation, accoding to the Fidelity.com eresearch website, in terms of Price/sales (TTM), the company is still selling at a bit of a premium to its peers with a ratio of 4.89 compared to the industry average of 3.68. Ensco does a bit better in terms of profitability as measured by the Return on Equity (TTM) with a ratio of 27.75%, compared to the industry average of 27.34%. Finishing up with Yahoo, we can see that there are 144.35 million shares outstanding with 143.02 milion that float. As of 5/12/08, there were 13.41 million shares out short representing 4.9 days of trading (the short ratio). As I have noted above, the company pays a small dividend of $.10/share yielding 0.1%. The last stock split was a 2:1 split back on September 16, 1997. What does the chart look like? 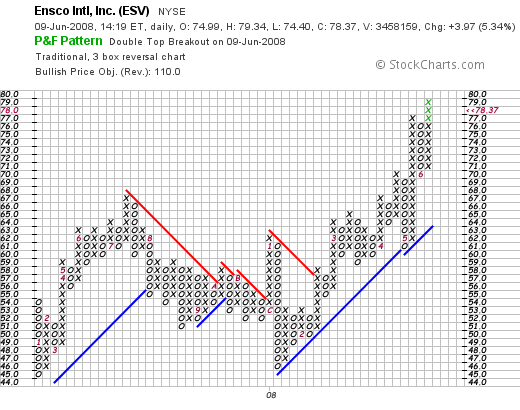 If we examine the Ensco (ESV) "point & figure" chart from StockCharts.com, we can see the recent price volatility and the price 'break-out' recently in February, 2008, when the stock broke through resistance at the $56 level and has continued to chart higher since. The stock chart looks quite strong to me. To summarize, I do not need to tell anyone about oil trading at over $100/barrel. In fact, well over $100. Without any great scientific analysis, we can fully expect that there will be an anxious effort to obtain reserves and discover more oil deposits. At least, from my amateur view, this appears to be a reasonable expectation. And a driller like Ensco should benefit from this effort. My selection of this stock is not based on any expectation about what oil prices should do and what this should mean to this company---although I find this environment helpful for this company. But rather, I selected this stock with all of the usual screens and devices that I use to identify potential stocks for inclusion. I like the recent quarter which beat expectations, the longer-term results, the valuation, and the chart. What is there not to like? Now, if only I had a signal or could justify buying some shares--then this would be a stock I would be buying. But meanwhile, I shall try to wait patiently for the proper moment to be doing anything. Thanks again for visiting! If you have any comments or questions, please feel free to leave them on the blog or email me at bobsadviceforstocks@lycos.com. If you get a chance, be sure and visit my Covestor page where you can read about my actual trading portfolio, my SocialPicks page where you can find out how my picks have been doing, and my Podcast Page where you can listen to me talking about some of the many stocks I write about here on this website. About six weeks ago, on April 23, 2008, I wrote up my Prosper.com "Update #3". As I have promised, I would like to share with you my continued experience on this peer-to-peer lending website. "In April, we saw the supply of loan listings with an attractive risk-return tradeoff hit an all time high and approximately double compared to the prior month. At the end of March, the supply of loan listings with an attractive risk-return tradeoff was approximately $5 million; and at the end of April the supply increased to approximately $11 million and has remained at that level into May. This significant increase in the supply of loan listings with an attractive risk-return tradeoff is attributed to the fact that on April 15 we commenced our business arrangement with WebBank, a Utah-chartered industrial bank. Through our agreement, all loans originated through the Prosper marketplace resulting from listings posted on or after April 15, 2008 are made by WebBank under its bank charter. Prosper provides services to WebBank in connection with the origination of such loans and Prosper services loans made to Prosper borrowers on behalf of registered Prosper lenders who purchase such loans. In effect, this partnership opened the platform to more borrowers, who may have previously been constrained by low state rate caps." As of June 7, 2008, I now have 83 loans. 77 are current, 1 is late (<15 days), 2 are late (15-30 days), 2 are late (2 months), and 1 is 4+ months late. The two loans that are 2 months late are in "collections" and the single loan 4 months+ late is in collections and is likely heading to be sold as a "default". I have now made a total of $5,011.80 is loans, received payments totaling $580.27, with an average interest rate of 14.62%. My daily interest accrual is currently $1.85. Net income totals (interest +fees + reward) totals $177.17. I have had -0- net defaults (although one loan with a principal balance of $(46.76) is heading for a default). I mention "rewards" above and indeed I have received a total of $75.00 for referrals to the Prosper.com website. Again, to get a 'third-party' analysis of my lending activity, and actually to review any lender, you can visit LendingStats and see how they view my account. They actually currently estimate my ROI as a negative (.25)%. This hasn't been my experience thus far, but we shall see how accurate they turn out to be. Please remember that these loans are high risk, fraught with the possibility of default and are unsecured. So enter this loan area at your own risk! Thanks so much for stopping by and visiting my blog! If you have any comments or questions, please feel free to leave them righth here on the website or email me at bobsadviceforstocks@lycos.com. Congratulations to all of the recent graduates! I shall be spending some of my weekend visiting with all of these great kids! Greif (GEF) "Revisiting a Stock Pick"
Earlier today I saw that an old favorite of mine, Greif (GEF) had made the list of top % gainers on the NYSE. Greif had a nice day trading today and closed at $68.92, up $2.80 or 4.23% on the day. However, that 4.23% gain was not enough by the close to keep it on the list. However, since it was on the list earlier, I certainly reserve the right :) to 'revisit' this stock! On April 5, 2005, I first discussed Greif (GEF) and actually purchased some shares at that time. Gef was trading at a split-adjust price of $37.03 at that time. Unfortunately, with my trading rules I sold my shares of GEF when they hit an (8)% loss just a few months later and do not currently own any shares or options on this stock. In fact, I revisited GEF on December 12, 2006, when the stock was trading at a split-adjusted price of $57.88. So here it is another year-and-a-half later and Greif (GEF) is making the list again, and once again I shall tell you why it belongs on the blog (and maybe in my portfolio if I get the opportunity). It is a big late, so let me try to be brief. "...engages in the manufacture and sale of industrial packaging products, and containerboard and corrugated products worldwide. 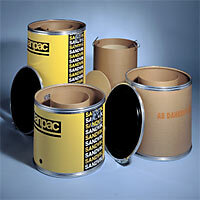 It operates in three segments: Industrial Packaging and Services; Paper, Packaging, and Services; and Timber. Industrial Packaging and Services segment offers industrial packaging products, such as steel, fiber, and plastic drums; intermediate bulk containers; closure systems for industrial packaging products; and polycarbonate water bottles." The stock moved higher today in anticipation of an earnings report that was scheduled to be announced after the close of trading. In fact right after the close of trading the company announced 2nd quarter 2008 results. Net sales climbed 13% (7% adjusted for the positive effect of currency translation), net income was $54.3 million or $.92/diluted Class A share, compared to $39.2 million or $.66/diluted Class A share last year. In itself that was a strong report. But more importantly than just a strong report, the impact of a financial result is best understood in terms of expectations. In this case, analysts polled by Thomson Financial had expected earnings of $.87/share. Thus the company beat expectations! Greif (GEF) indeed did raise expectations by raising fiscal year 2008 guidance to $4.25 to $4.45/Class A share, from its previous forecast of $4.15 to $4.35/share. I really do like these sorts of announcements from a company! But let's take a quick look at the longer-term picture of Greif (GEF) as my 'pick' depends not only on strong current results but a longer-term record of persistence of good results. In this case, reviewing the Morningstar.com "5-Yr Restated" financials on Greif (GEF), we can see that revenue has been steadily increasing from $1.92 billion in 2003 to $3.32 billion in 2007 and $3.42 billion in the trailing twelve months (TTM). Earnings have also been steadily and dramatically increasing from $.28/share in 2003 to $.92/share in 2007 and $1.02/share in the TTM. Dividends are great. But a company that can steadily increase its dividend is even nicer! I recently heard Jim Cramer also comment on his interest in increasing dividends. This isn't a new concept. I do not restrict myself to stocks that even pay dividends, but when I can find a stock that not only pays dividends but also increases dividends regularly I certainly think this is another attractive point about a stock pick. In 2003, Greif (GEF) paid $.28/share. This was increased each year to $.92/share (a more than 3-fold increase in the dividend in 4 years! ), and the company has paid $1.02 in the trailing twelve months. Free cash flow is solid with $103 million in 2005 increasing to $273 million in 2007 and falling back slightly to $190 million in the trailing twelve months. The balance sheet appears at least adequate with $107 million in cash and $797 million in other current assets. This total of $904 million in current assets when compared to the $624 million in current liabilities yields a healthy current ratio of 1.45. The company does have a significant level of long-term liabilities reported at $1.1 billion, but this does not appear to be a problem for Greif (GEF). In terms of valuation, Greif is a mid cap stock with a market cpaitalization of $3.23 billion. The trailing p/e according to Yahoo "Key Statistics" on Greif (GEF) is 22.37 with a forward p/e (fye 31-Oct-09) estimated at 13.92. The PEG is a very nice 0.91. (5 yr expected). Referring to the Fidelity.com eresearch website, we find that the Price/Sales ratio is reasonable at 0.90 compared to the industry average of 0.86. The company is far ahead of its peers with a return on equity (TTM) ratio of 19.21% compared to the industry average of a negative (11.73)%. Yahoo reports 46.81 million shares outstanding with 41.90 million of them that float. As of May 12, 2008 there were 2.41 million shares out short representing 9.2 trading days of volume (the short ratio) or 10.2% of the float. This was down slightly from the 2.45 million shares out short the prior month. I don't fully understand why so many shares would be out short on such a 'high quality' company from my perspective. But then again, I don't understand a lot of things :). However, with the strong earnings report coming out today, I suspect the short squeeze may have started today in anticipation of the earnings report, as short-sellers rushed to cover their 'negative bets' looking for shares to purchase. I use an arbitrary '3 days' as a level of significance--with Greif at 9 days, this is something to consider. As I have noted the company pays a nice dividend--and has been regularly increasing it. In fact, the forward dividend rate is $1.52/share yielding a nice 2.3%. This still represents a payout ratio of only 33% giving the company lots of leeway to operate and increase it further in the future. As I also noted above, the company last split is stock with a 2:1 stock split effective April 12, 2007. Needless to say, from my amateur perspective, this is a beautiful chart of incredible price momentum strength. In summary, there are several reasons why I really like this stock. First of all they had a great earnings report which beat expectations and then they went ahead and raised guidance. They have a record of steady revenue and earnings growth while keeping their outstanding shares quite stable. The company has been paying a dividend and has been consistently been raising it. They are producing an increasing amount of free cash flow and the balance sheet appears solid. Valuation-wise, the company appears reasonably priced with a p/e in the low 20's and a PEG under 1.0. The Price/Sales is fairly average for its industry, with a Return on Equity ahead 'of the pack'. Finally, there are a bunch of shares out short that need to be covered giving the stock some additional support. The chart looks solid. Now, if only I had a signal to be buying a new position, you can "bet your sweet bippy" that this is the kind of stock I would be buying! But seriously, this is my kind of stock and deserves a third pick (!) on this blog. If you have any comments or questions, please feel free to leave them right on the website or email me at bobsadviceforstocks@lycos.com. If you get a chance, be sure and visit my Covestor Page where you can track my actual trading portfolio, my SocialPicks Page where you can monitor my many stock picks, and my Podcast Page where you can download some mp3's of me discussing some of the many stocks I write about here on the blog. I hope you all have a great week ahead! I wrote Friday about my decision to make what I call a "lateral" move, selling my IHS stock (IHS) and buying 105 shares of Graham Corp. (GHM). Graham is actually an 'old friend' of mine having first written about Graham October 27, 2007, at a split-adjusted price of $46.60, on the suggestion of Doug S., a great and loyal reader of this blog. I have also owned shares of Graham (GHM) for short periods of time (literally) having purchased 400 shares 11/23/07 at a split-adjusted cost of $49.98 and then selling those shares just 3 days later at split-adjusted price of $52.91. 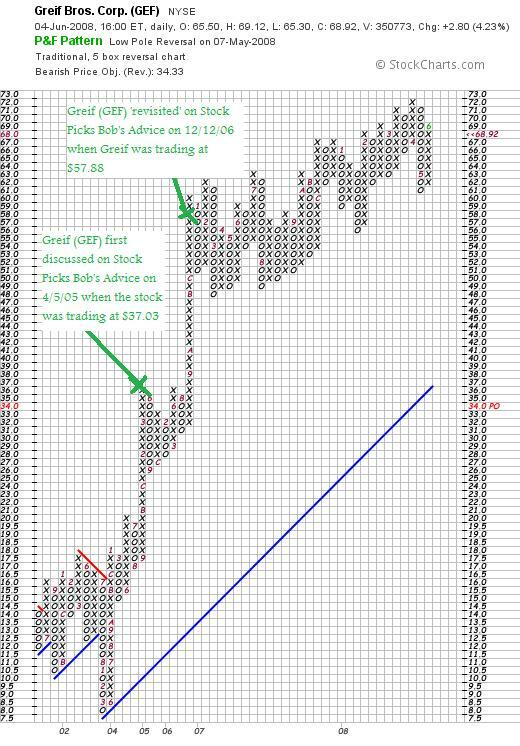 This was a "trade" and not exactly within my usual 'disciplined trading strategy'! I purchased 210 shares once again 1/10/08 at $46.30, only to find myself losing money this time and unloading shares 1/16/08 when I found myself losing money and the stock trading at $41.30. They say that 'third time is the charm'. So when looking for a stock to replace my IHS holding, I saw that GHM was on the move once more making the list of top % gainers and I purchased 105 shares at $64.40-- Graham (GHM) closed Friday at $68.44, up $6.69 or 10.83%. First of all, what exactly do they do? "...engages in the design, manufacture, and sale of vacuum and heat transfer equipment used in the chemical, petrochemical, petroleum refining, and power generating industries worldwide. 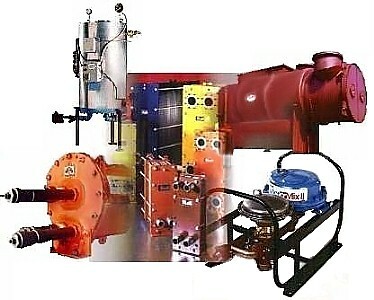 Its products include steam jet ejector vacuum systems; surface condensers for steam turbines; vacuum pumps and compressors; various types of heat exchangers, including helical coil heat exchangers marketed under the Heliflow name; and plate and frame exchangers." How did Graham (GHM) do in the Latest Quarter? As is often the case in the stocks I review, it was the announcement of earnings, in this case 4th quarter 2008 results, that drove the stock higher on Friday. Before the opening of trading, the company reported that fourth quarter revenue grew $1.9 million or 9% to $22.8 million for the fourth quarter the prior year. Net income for the quarter came in at $4.2 million, up 22.7% compared to net income of $3.4 million during the same period last year. On a diluted per share basis this worked out to $.83/share, up 20.3% compared with $.69/diluted share the prior year same period. The company noted that the backlog increased a healthy 40% to $75.7 million on March 31, 2008, compared with $54.2 million in backlog on March 31, 2007. The company guided the full year 2009 to a 15 to 20% revenue increase. Reviewing the Morningstar.com "5-Yr Restated" financials on Graham (GHM), we can see that after a dip in revenue from $44.5 million in 2003 to $37.5 million in 2004, the company has been steadily growing sales to $66 million in 2007 and $84 million in the trailing twelve months (TTM). Likewise, earnings dipped from $0.00 in 2003 to a loss of $(.20)/share in 2004. Since then earnings have grown rather dramatically to $.10/share in 2005, $1.20/share in 2007 and $2.80/share in the TTM. The company also pays a small dividend which was increased from $.06/share in 2003 to $.08/share in 2004 and has held constant at that level. The outstanding shares, while small, are rather stable with 4 million share reported in 2003 increasing only to 5 million in the TTM. Free cash flow which was a negative $(5) million in 2005, has increased to $4 million in 2007 and $17 million in the TTM. The balance sheet appears solid with $3 million in cash and $48 million in other current assets. This total of $51 million can easily cover both the current assets of $16.8 million and the negligible $1.8 million in long-term liabilities almost 3 times over. The current ratio is calculated at a healthy 3.03. What about some valuation numbers on this stock? Reviewing some of the numbers on Yahoo "Key Statistics" on Graham (GHM), we can see that this company is a 'small cap' stock with a market cap of only $339.46 million. The trailing p/e is a reasonable (imho) 23.99 with a forward p/e of only 17.96 (fye 31-Mar-09). No PEG is available (probably because there aren't any analysts out there estimating 5-yr results!). Looking at a couple of value statistics from the Fidelity.com eresearch website, we can see that GHM has a Price/Sales figure of 3.97, well ahead of the industry average of 1.41. However, this premium in price/sales may be justified in light of the Return on Equity (TTM) figure of 39.16%, well ahead of the industry average of 22.26%. Finishing up with Yahoo, we can get a feel for how small this company really is when we see that there are only 4.96 million shares outstanding and only 4.33 million of them actually float. As of 5/12/08 there were only 43,430 shares out short representing a very low 'short ratio' of only 0.3 days. This also represents only 0.9% of the float. According to Yahoo, the company is now paying an increased dividend rate of $.12/share yielding 0.2%. The last stock split was a 5:4 stock split January 3, 2008. 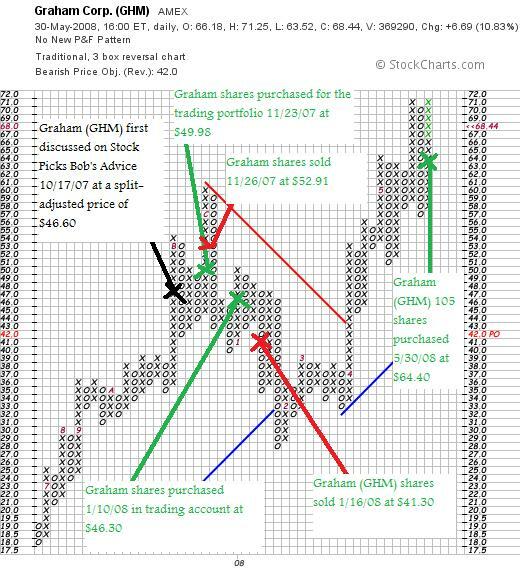 Reviewing the "point & figure" chart on Graham (GHM) from StockCharts.com, we can see the tremendous volatility with the stock moving strongly higher from $18/share in June, 2007, to a high of $61/share in December, 2007, only to plunge back to a low of $28 in January, 2008. 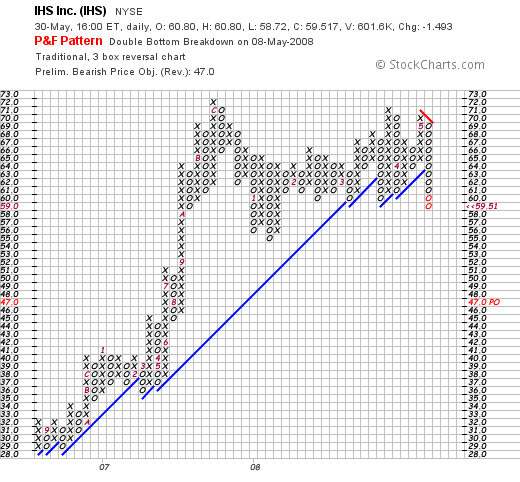 The stock has moved strongly higher since January, 2008, to its recent price level at $68.44. What do I think about this stock? To summarize, I sold my IHS shares and discussed my rationale and have substituted Graham (GHM) a small cap stock that trades on the AMEX in its place. The company reported a great quarterly report Friday and the stock moved sharply higher. The valuation is reasonable and the company has a strong backlog of sales orders. Unfortunately, the stock is rather thinly traded with an average daily trading volume of only 211,588 shares. This may result in quite a bit of volatility as I have already experienced and may lead to me getting 'shaken out' of this position once again! Thanks again for dropping by! If you have any comments or questions, please feel free to leave them on the blog or email me at bobsadviceforstocks@lycos.com. If you get a chance, be sure and visit my Covestor Page where my actual trading portfolio is monitored, or my SocialPicks Page where my many stock picks are monitored. If you get a chance, stop by and visit my Podcast Page where you can listen to some of the many stocks I write about discussed in a podcast format. A few days ago I discussed how I was looking into an iBond. So I visited my local Wells Fargo Bank and purchased a $5,000 bond for a long-term investment. And the more I thought about, the more I became perplexed about this new limit on individual savings bond purchases each year. "I think it's a terrible move. Here's the breakdown: Savers can now buy a total of $20,000 in U.S. savings bonds. That's $5,000 each of Series EE (the traditional savings bond) and Series I savings bonds (the inflation-indexed security you mentioned) online and another $5,000 each in paper. In sharp contrast, before the turn of the year individual savers could sock away a total of $120,000 in U.S. savings bonds. The shift is even more significant than these dollar figures suggest. The change makes it that much harder for individual investors to hedge a substantial portion of their savings against the ravages of inflation over time. Yet many finance scholars advocate that inflation-indexed bonds should be the foundation of a long-term retirement portfolio. The big attraction for individuals of the inflation-indexed savings bonds is that savings compound tax deferred until the bonds are cashed in a 30 year period. Plus, you don't pay any commission to buy and sell savings bonds." We are in a war in Iraq and Afghanistan. And it is costing us plenty. "In 2008, its sixth year, the war will cost approximately $12 billion a month, triple the "burn" rate of its earliest years, Nobel Prize-winning economist Joseph E. Stiglitz and co-author Linda J. Bilmes report in a new book. Beyond 2008, working with "best-case" and "realistic-moderate" scenarios, they project the Iraq and Afghan wars, including long-term U.S. military occupations of those countries, will cost the U.S. budget between $1.7 trillion and $2.7 trillion — or more — by 2017." On June 12, 1944, President Franklin D. Roosevelt had a 'fireside chat' with Americans and he spoke to us about the need to buy bonds to finance the war effort. "And it goes almost without saying, too, that we must continue to provide our Government with the funds necessary for waging war not only by the payment of taxes- which, after all, is an obligation of American citizenship—but also by the purchase of war bonds- an act of free choice which every citizen has to make for himself under the guidance of his own conscience. Whatever else any of us may be doing, the purchase of war bonds and stamps is something all of us can do and should do to help win the war. I am happy to report tonight that it is something which nearly everyone seems to be doing. Although there are now approximately sixty-seven million persons who have or earn some form of income, eighty-one million persons or their children have already bought war bonds. They have bought more than six hundred million individual bonds. Their purchases have totaled more than thirty-two billion dollars. These are the purchases of individual men, women, and children. Anyone who would have said this was possible a few years ago would have been put down as a starry-eyed visionary. But of such visions is the stuff of America fashioned." But I am not really surprised. Shortly after 9/11, President Bush delivered a speech designed to rally the nation behind the war effort. But he didn't really ask for much sacrifice or the purchase of war bonds like FDR. Instead, he called on the American Consumer to....yes...go shopping! "After all that has just passed, all the lives taken and all the possibilities and hopes that died with them, it is natural to wonder if America's future is one of fear� Americans are asking, 'What is expected of us?'" He then answered his own rhetorical question with a line Americans wanted to hear. "I ask you to live your lives and hug your children." He could have stopped there — a gem of a line, a Hallmark-card-sized summation of the littlest and best things we can do — but when American shores are smoldering still, Bush must have realized that more couldn't hurt. Be calm, not scared; be tolerant, not blind; be generous, not selfish; be patient, patient, patient, at airports and skyscrapers and landmarks and hotels and traffic stops and bus stops and train stations and anywhere else it is possible to imagine a public vulnerability, which of course is everywhere. "And finally, please continue praying for the victims of terror and their families, for those in uniform and for our great country. Prayer has comforted us in sorrow and will help strengthen us for the journey ahead." For God's sake keep shopping? Is that the best he could do? "Many observers are asking whether U.S. indebtedness to foreigners might pose any subtle hidden threats to the U.S. economy or even to U.S. national security. With China alone holding $1.2 trillion in reserve assets and foreigners collectively holding more than twice that in U.S. Treasury securities, is there any risk that the United States might be subject to economic blackmail? What about the rapid proliferation of so-called sovereign wealth management funds, most famously China's $3 billion investment in the private equity group Blackstone? Sovereign wealth funds now control nearly $2 trillion in assets, more than stand-alone hedge funds. Is there a risk that foreign governments will use their financial relationships to compromise U.S. security? 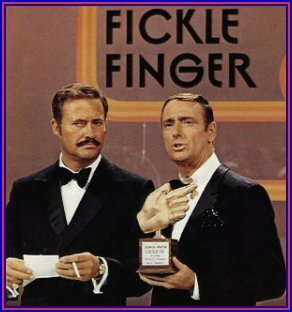 Is there any danger of exotic "Goldfinger"-like scenarios where foreign governments might use their massive leverage to precipitate a wholesale financial collapse in the United States? 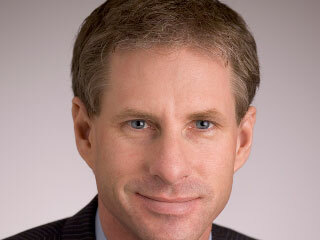 The short answer is these more extreme risks are unlikely to materialize, but the United States continued dependence on foreign borrowing is a significant vulnerability in the event of shock, such as a collapse in U.S. housing prices, or an extreme national security breach, that might slow the inflow of new funds into the United States." So how does the Treasury Department explain the new rules as of January, 2008, that reduced the maximum annual purchase of savings bonds from $120,000 to $20,000 per individual? Is there not enough debt to go around? Do we need to ration the opportunity of Americans to invest in their own government? Is the concept of Americans buying Savings Bonds in the time of war obsolete, or to quote Alberto Gonzales, "quaint"? The budget deficit problem is not improving. "(AP) The federal budget deficit is running at a pace that is more than double last year's imbalance through the first four months of the budget year. In its monthly review of the government's finances, the Treasury Department said Tuesday that the budget was in surplus in January, but totals $87.7 billion so far this budget year, double the $42.2 billion imbalance recorded during the same period in 2007. The new budget year started last Oct. 1. The Bush administration sent its final budget request to Congress last week, projecting that the deficit for all of 2008 will total $410 billion, very close to the all-time high in dollar terms of $413 billion in 2004. So far this year, federal spending is 8.3 percent ahead of last year's pace, at $949.1 billion. That is far ahead of the 3.2 percent increase in revenues, which have totaled $861.4 billion in the current budget year." So I guess they aren't cutting back on the purchases of Savings Bonds and iBonds by individuals because there isn't any debt that needs to be funded. So what is the explanation given? "The annual limitation on purchases of United States Savings Bonds will be set at $5,000 per Social Security Number, effective January 1, 2008. The limit applies separately to Series EE and Series I savings bonds, and separately to bonds issued in paper or electronic form. Under the new rules, an individual can buy a maximum of $5,000 worth of electronic and paper bonds of each series in a single calendar year, or a total of $20,000, in single ownership form. If paper bonds are issued in co-ownership form, the limit applies to the first-named co-owner. All limits are based on the issue price of the securities. The reduction from the $30,000 annual limit in effect for both series since 2003 was made to refocus the savings bond program on its original purpose of making these non-marketable Treasury securities available to individuals with relatively small sums to invest. Approximately 98 percent of all annual purchases of savings bonds by individuals are for $5,000 or less. The minimum purchase price for Series EE bonds is $25, whether purchased electronically or in paper form; the I bond minimum purchase is $25 for bonds issued in electronic form and $50 for those in paper form. Savings bond purchases have been subject to an annual limit since Series E Bonds were first issued in 1941. Over the years, limits have been adjusted by the Treasury Department several times and have ranged from a low of $3,750 (at issue price) for Series E bonds from 1941 through 1947 to the $30,000 (issue price) limit that most recently applied to both Series EE and Series I bonds. The limit was last set at $5,000 (issue price) in 1973." 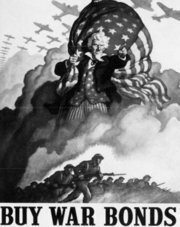 So in their words, the reason they are reducing the ability of Americans, in time of war, to buy savings bonds is because they wanted "to refocus the savings bond program on its original purpose of making these non-marketable Treasury securities available to individuals with relatively small sums to invest." O.K. I still don't get it. The government would somehow rather borrow from foreign governments and foreign investors than sell savings bonds to individuals. Is this what patriotism is all about? And I just wanted to buy more than one savings bond. A few moments ago I sold my 140 shares of IHS (IHS) that I had puchased 10/1/07 with a cost basis of $58.53. These shares were sold at $59.29 for a gain of $.76 or 1.3% since purchase. This sale doesn't really fit into my usual 'trading rules'. But I always retain the right :) to arbitrarily 'pull the plug' on any of my holdings. Perhaps it is because my portfolio is so small at 6 positions now--or I am just anxious to keep up with my Covestor results where I am just staying ahead of the S&P--but in any case, with the market basically moving higher and IHS acting rather weak the last few days, I decided to move on. Since I am not really selling the stock on 'bad news', except my own perceived assessment of the stock's prospects, and this isn't really 'good news' either, I consider this more or less a lateral in football terms. First of all, as I write, the Dow is trading at 12,672.35 up 26.13 and the Nasdaq is at 2,527.93. And IHS? IHS is at $59.22, down $(1.79) or (2.93)% on the day. "IHS (IHS - Cramer's Take - Stockpickr), which provides critical information, decision-support tools and related services to the energy, defense, aerospace, construction, electronics and automotive industries, has been downgraded to hold. Strengths such as robust revenue growth, a solid financial position and EPS improvement are weighed down by disappointing return on equity. For the first quarter, revenue increased 30% year over year to $198.8 million, and earnings per share rose to 34 cents from 32 cents. Regardless of the somewhat mixed results with the debt-to-equity ratio, the company's quick ratio of 0.83 is weak. The company's gross profit margin is rather high at 55%. Its net profit margin of 11% compares favorably to the industry average. The company's current return on equity has slightly decreased from the same quarter one year prior and lags the industry average. Shares have risen 61% in the past year, beating the S&P 500. The gains have netted the stock a price-to-earnings ratio of 44.68, which places it at a premium to others in its industry. IHS had been rated buy since May 13." "A measure of a company's liquidity and ability to meet its obligations. Quick ratio, often referred to as acid-test ratio, is obtained by subtracting inventories from current assets and then dividing by current liabilities. Quick ratio is viewed as a sign of company's financial strength or weakness (higher number means stronger, lower number means weaker). For example, if current assets equal $15,000,000, current inventory equals $6,000,000, and current liabilities equal $3,000,000, then quick ratio amounts to: ($15,000,000 - $6,000,000)/$3,000,000 = 3. Since we subtracted current inventory, it means that for every dollar of current liabilities there are three dollars of easily convertible assets. In general, a quick ratioof 1 or more is accepted by most creditors; however, quick ratios vary greatly from industry to industry." Even so, the current ratio, with a total of $406 million in total current assets compared to the current liabilities of $400.2 million, is also just above 1.0, suggesting some financial 'stress' as well imho. These figures are from the Morningstar.com "5-Yr Restated" financials page which otherwise doesn't look too shabby. "A recent academic study1 by professors Josef Lakonishok and Inmoo Lee provides an answer. The professors discovered that while stocks being bought by insiders proceed to modestly outperform the market, so do stocks sold by the insiders. Overall, therefore, there is not much of a performance differential between the stocks insiders are buying and the stocks they are selling." In any case, IHS recently had a significant sale by a director which was reported on April 24, 2008, when it was noted that Director Steven A. Denning sold 744,501 shares of stock at $65.05. In itself it may not be enough to change my mind, but as a piece of a puzzle, it may be worthwhile to consider. This had followed a sale reported on April 2, 2008, as reported, of Co-President, Co-COO Jeffrey R. Tarr selling 4,573 shares of common stock at $65.84/share. That particular sale was under what is called a 10b5-1 trading plan which is a plan that allows pre-arranged sales regardless of nonpublic information they may possess. However, that sale also followed a sale April 1, 2008, by Executive Vice-President Daniel Yergin who dropped 10,00 of his shares between $66 to $69 apiece. Going through the news we can see that Jeffrey D. Sisson sold 5,273 shares March 28, 2008, also through a pre-arranged 10b5-1 trading plan, John Oechsle, also through one of these same plans sold 3,000 shares March 28, 2008, CFO Michael Sullivan exercised options for 5,000 shares under the same plan and sold them on March 28, 2008, Yergin reported March 28, 2008, selling another 18,403 shares, Senior Vice-President Stephen Green sold 6,600 shares as reported the same date under the same program, and IHS Co-COO Rohinton Mobed reported selling 10,980 shares of common stock in an announcement on March 28, 2008. It is really appropriate to exercise caution before concluding anything about these sales. Many executives have stock options as really part of their employment package and sell stock regularly to fill their own financial planning requirements. But all of these sales do give you pause, don't you think? On a positive note, after the company's last quarterly report, they did indeed raise guidance on full-year sales to a growth of 21 to 23% from the prior guidance of growth of 18 to 20% year over year. Ironically, the 1st quarter 2008 results announced on March 19, 2008, did beat expectations on both earnings and revenue. So not all of the news is negative on this company. So today, with the stock weak while most other stocks climbed, I looked at the chart, thought about the financial questions raised, noted the insider selling activity (although most of that was fairly routine) and decided to 'move on'. Wish me luck. I do think I need to do these types of relatively conservative 'laterals' from time to time. Thanks again for visiting! If you have any comments or questions, please feel free to leave them on the blog or email me at bobsadviceforsocks@lycos.com. Hello Friends! Thanks so much for stopping by and visiting my blog Stock Picks Bob's Advice! As always, please remember that I am an amateur investor, so please remember to consult with your professional investment advisers prior to making any investment decisions based on information on this website. Earlier today I sold a portion of my Copart (CPRT) stock after it hit my first assigned appreciation target--that is it had increased in price to a 30% appreciation over my purchase cost. With that event, I sold 1/7th of my holding (and wrote about it on my blog as well). My own portfolio management strategy depends on the performance of my own stocks to give me the 'signals' to be either buying (on good news events like sales on appreciation) or 'sitting on my hands' which happened yesterday on a bad news event like a sale on a decrease in the stock price as I experienced with my ResMed holding. The other part of my portfolio management strategy involves dealing with sales at the extremes of my portfolio size. For me, my minimum number of holdings is five and my maximum is twenty. I try to 'float' my portfolio between these two extremes based on the activity of my own stocks. In this case, sitting at five positions, my minimum, the sale of a portion of Copart (CPRT) gave me a signal or 'permission slip' as I sometimes write, to be looking for a new stock to buy. And thus, as I have written before, with that nickel burning a hole in my pocket, I set out to find a new stock to purchase. Checking the list of top % gainers on the NYSE earlier today, I saw that Visa (V) had made the list. However, the other stocks moved higher and V sold off a bit, so by the end of the day it was no longer on the top % gainers. However, by that time I had already purchased 70 shares at $85.92 for my trading account. Visa (V) closed at $85.25 up $3.33 or 4.06% on the day. "...through its subsidiaries, operates retail electronic payments network worldwide. It facilitates commerce through the transfer of value and information among financial institutions, merchants, consumers, businesses, and government entities in approximately 170 countries and territories." And how did it do the latest quarter? On April 28, 2008, Visa (V) reported strong 2nd quarter 2008 results. Revenue and net income rose strongly with net income climbing 28%. The company beat expectations coming in with adjusted earnings of $.52/share ahead of Thomson Reuters' consensus of $.46/share. Revenue climbed to $1.5 billion ahead of expectations of $1.45 billion. The stock actually dipped on this report since it is a relatively recent IPO, having come public on March 18, 2008, and having climbed sharply from the $44/share level with a 66% increase at the time of the earnings announcement. Looking longer-term at the Morningstar.com '5-Yr Restated' financials page, we can see a steady increase in revenue from $1.98 billion in 2003 to $3.59 billion in 2007 and $4.8 billion in the trailing twelve months (TTM). There has been an increase from 1.02 billion shares in 2007 to 1.53 billion in the TTM. I assume this is related to the recent public offering of shares. The free cash flow numbers suggest a one-time dip in free cash flow with $8 million in 2007 dipping to a negative $(20.9) billion in the trailing twelve months. Quite frankly, I didn't pay a lot of attention to this figure at the time of purchase (?). I don't think it is a problem, but would wait for updated Morningstar.com figures as things progress. The balance sheet is solid with $10 billion in cash and other current assets vs. the $(5.8) billion in current liabilities. We can certainly see the incredible price momentum on this stock. So while the Morningstar.com page is a bit incomplete from my perspective, the recent quarter was strong, I am well familiar with this particular franchise :), and the chart looks great. Anyhow, I added it to my portfolio---so now I have a 'financial' stock that appears to be moving strongly higher. Thanks so much for stopping by and visiting! If you have any comments or questions, please feel free to leave them on the blog or email me at bobsadviceforstocks@lycos.com. Earlier this morning, my Copart (CPRT) stock hit an appreciation target of a 30% gain triggering a partial sale of 1/7th of my position or 30 shares which were sold at $43.80/share. This represented a gain of $10.08/share or 29.9% since purchase. The shares were initially acquired 9/27/07 at a cost basis of $33.72/share. As you may know, I use sales like today's sale as a 'signal' to buy an additional position if I am under my maximum of 20 positions. Since, after yesterday's sale of ResMed (RMD), I am at my minimum of 5 positions, well under my maximum, this sale indeed did give me a 'permission slip' to be buying a new position. A few moments ago I purchased 70 shares of Visa (V) as that new position. I shall be writing this up a little later. When would I sell shares next and how many? Well on the upside, my next sale point would be at a 60% appreciation target which with the cost basis being at $33.42, this would work out to 1.6 x $33.42 = $53.47. At that time, my plan would be to sell 1/7th of the remaining shares which now at 180 shares would be 180/7 = 25 shares. On the downside, after a single sale (at the 30% appreciation level) I move my sale point up from an (8)% loss to break-even, or in this case would mean selling all of my remaining 180 shares if the stock should decline to $33.42. Thanks again for stopping by! If you have any comments or questions, please feel free to leave them on the blog or email me at bobsadviceforstocks@lycos.com. A few moments ago I sold all of my shares of ResMed (RMD), which amounted to 150 shares, at $38.46. These shares were purchased 2/4/05 at a cost basis of $29.87 giving me a long-term gain of $8.59 or 28.8% on these shares. This sale brings me down to my 'minimum' portfolio size of 5 positions. I have set my maximum at 20 positions and my minimum at 5. What this means is that with this sale, as before, since it is on 'bad news', which means selling on a defensive basis as part of a decline, I shall be 'sitting on my hands' with the proceeds. That is, I shall not be replacing this position. However, since I am now at 5 positions, if any of these are sold on 'bad news' I shall be looking for new stocks to replace them. I hope you follow this 'strategy'. I would also like to explain the why of my sale. Basically after my initial purchase of ResMed (RMD), I had two partial sales at appreciation targets--at 30% and 60% appreciation levels. My approach to stocks requires me to sell stocks if they decline to certain levels. After an initial purchase, I sell a stock if it declines to an (8)% loss. After a single sale at my first appreciation target (30%), I sell if a stock declines--slips back--to 'break-even'. With additional sales, my sell-point is increased to 50% of the highest appreciation sale. With ResMed having been sold partially at a 60% appreciation level, this means that when the stock dropped to under a 30% appreciation level I was given the 'signal' to sell the stock. Actually, the stock was 'flirting' with a sale yesterday as it bounced at that 30% appreciation level under and over. I hoped it wouldn't break through but with today's market weakness, ResMed dipped and I sold shares. If we look at the ResMed "point & figure" chart from StockCharts.com, we can see the technical weakness with the stock, after peaking at $56 in February, 2007, has struggled to move higher, failing to make a new high in December, 2007, when it reached $54, and then breaking through support currently. Thanks again for stopping by and visiting! If you have any comments or questions, please feel free to leave them on the blog or email me at bobsadviceforstocks@lycos.com. If you get a chance, visit my Covestor Page where my trading account is tracked, my SocialPicks page where all of my stock picks for the last year-and-a-half have been monitored, and my podcast page where you can download some mp3's and listen to me discuss a few of the many stocks I write about here on the website.